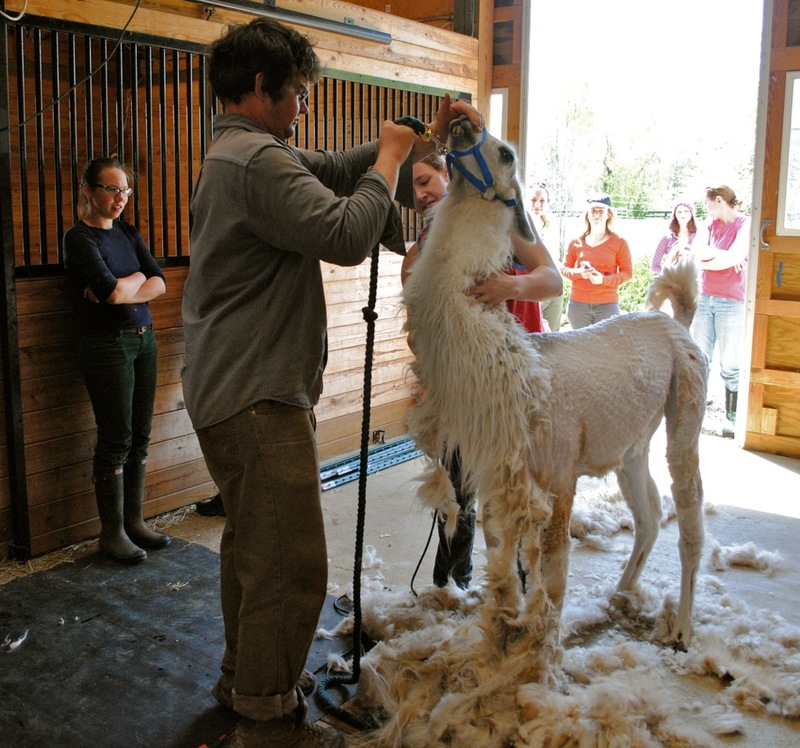 Well, it’s been nearly two years since Jerry got the hackjob of a shearing I did that first summer I owned him. 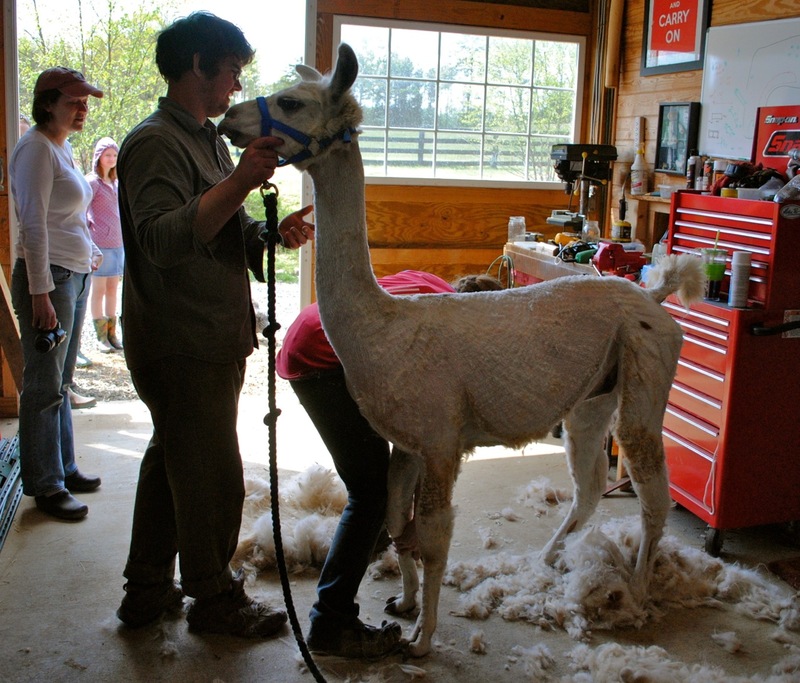 Since then his fleece hasn’t really grown out the way a fiber llama’s would. 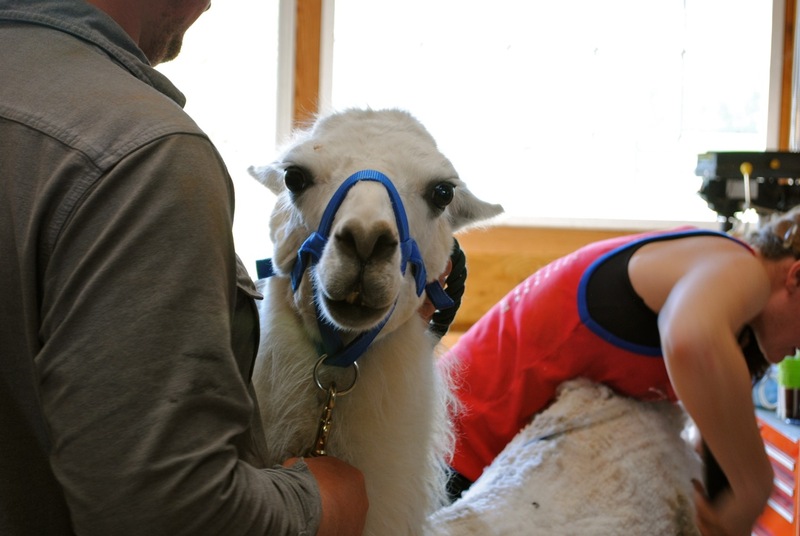 Those llamas you see at ag fairs and fiber festivals have fleece that falls to their knees. Jerry’s headed just south of his belly and then started to look more rasta than long and luxurious. It looked like it was beginning to felt right on his back. With summer coming (and I am predicting a hot and awful one) it was time to lose those matted locks. 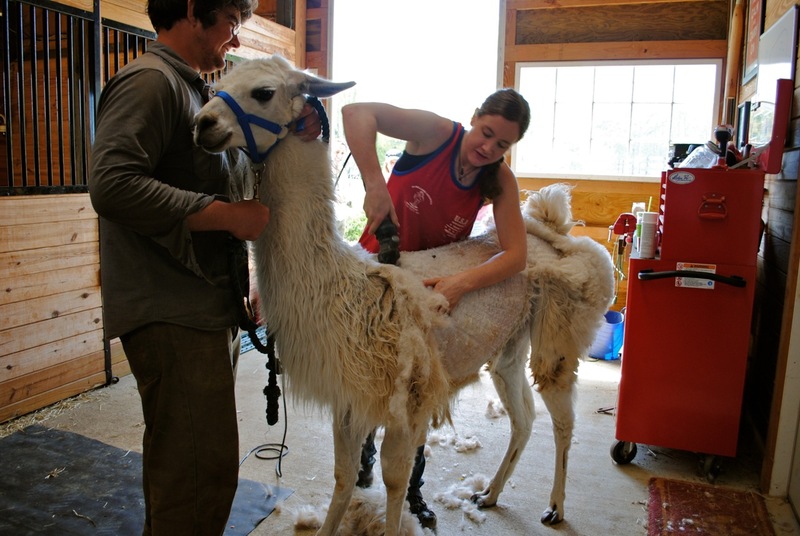 So when the awesome Emily the Shearer came to Juniper Moon Farm to do a mini shearing this week, I took the chance to have Jerry done. 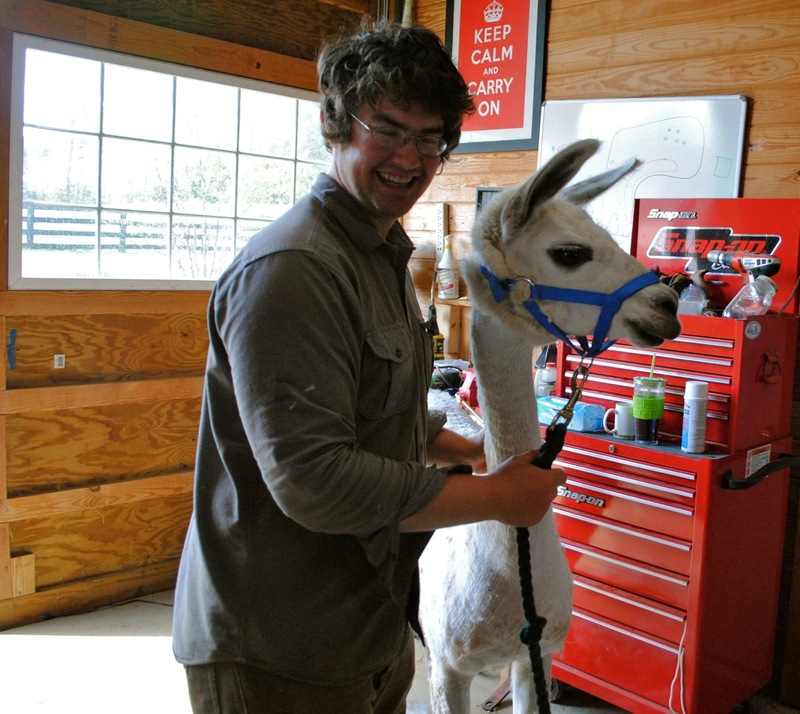 Emily’s not crazy about shearing llamas. And to be honest, I don’t blame her. As fiber animals go, they’re bratty and they don’t like to be touched – AND they’re rather too large to be easily controlled without a restraining “chute”, which I don’t have. Zac did wonderfully well keeping Jerry “calm”, but despite his best efforts, Emily, Caroline and I all got spit upon. Now that’s saying something, because as llamas go, Jerry isn’t a spitter. Thankfully Emily really knows her stuff, and she’s fast. As well she should be, freshly back from her time in New Zealand at The Golden Shears. 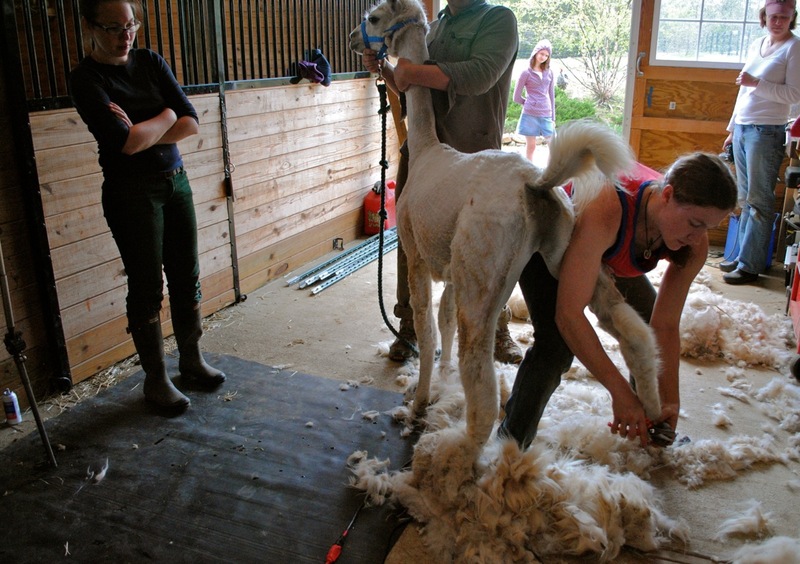 She can knock out a sheep in no time flat – but that’s what comes of spending six weeks shearing 200 sheep a day! For as bad mannered and upset as he was, though, he did pretty well – though I think a lot of that come down to Zac and Emily being so good at handling him. He looks like a hobby horse on a stick, no? 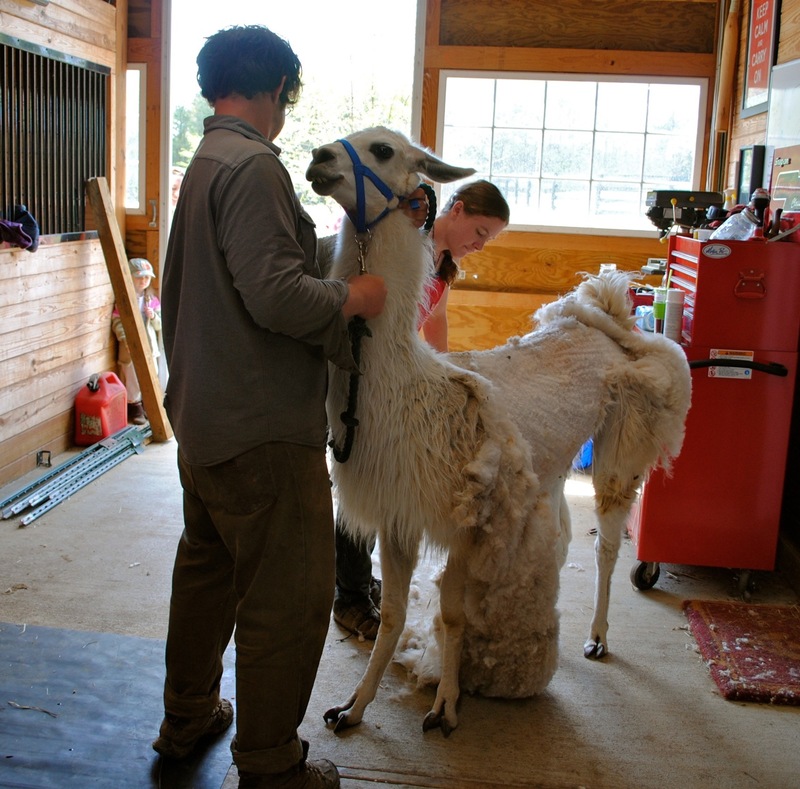 Although he looks rather sad and undignified without his fleece it will make a huge difference in his comfort level this summer – llamas are better suited to colder climates – they come from the Andes, after all! For the finishing touch? A much – needed pedicure. I totally owe Emily big on this one. Especially since in two years I’ll need to ask her to do it again. He was still cranky last week when we visited him, although by the end of the week, he would come over to visit if we walked back near his fence. He did look awfully silly, though.